312. What is the ratio of the total sales of branch B2 for both years to the total sales of branch B4 for both years? 313. 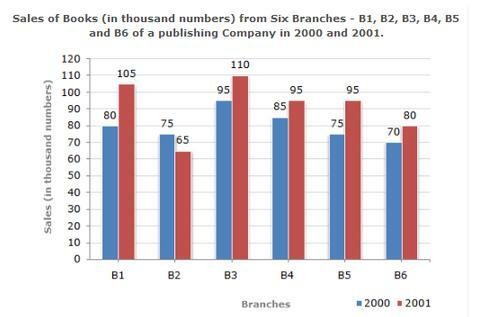 Total sales of branch B6 for both the years is what percent of the total sales of branches B3 for both the years? 314. What percent of the average sales of branches B1, B2 and B3 in 2001 is the average sales of branches B1, B3 and B6 in 2000? 315. What is the average sales of all the branches (in thousand numbers) for the year 2000? 316. Total sales of branches B1, B3 and B5 together for both the years (in thousand numbers) is?